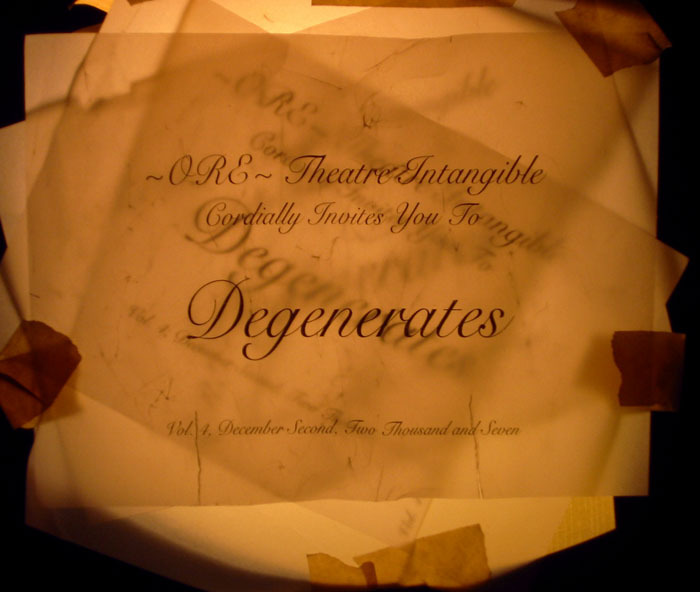 Today’s podcast is Degenerates, the 25th podcast and 4th episode of the WRVU era — originally broadcast December 2nd, 2007. The players are William Davis from Oh No It’s Howard; Cody Bottoms from The Manpower, A Parade, and more; Paul Cain; and myself. Jacob Riley also contributed some sounds via phone. I did the live mixing, editing, and mastering. The theme of Degenerates is. . . you guessed it. . . degeneration. We recorded samples and copied them through multiple generations. We ran them through multiple passes of distortion. We wanted to see how far we could use and abuse sounds. The result is one of the nastiest, dingiest, dirtiest sounding shows we’ve ever done; it’s also one of our best. If you like our show, spread the word by telling your friends, sharing on your favorite social networking sites, and leaving us feedback on iTunes. Here’s Degenerates.